On Friday, 8 January, the two leaders of the Polish Ice Hockey League (PLH) and last year’s finals rivals played a much-anticipated match in front of one of the largest crowds Cracovia has drawn all year. 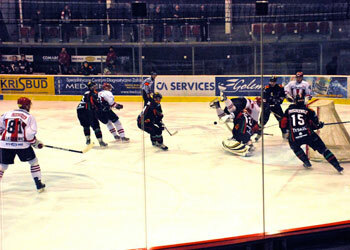 GKS Tychy won their last match-up against Cracovia at home on 13 December, 3-1. After a cautious start by both teams, and several excellent stops by Tychy’s goalkeeper Arkadiusz Sobecki, Tychy was quick to find its rhythm and launched counterattack after counterattack, capitalizing on takeaways below the goalline and intercepted passes. In the ninth minute, Tychy forward Adam Bagiński beat Cracovia keeper Rafał Radziszewski in a net-crashing close-range exchange to open the scoring. Cracovia nearly drew the match to a tie in the thirteenth minute when captain and league points leader Leszek Laszkiewicz shovelled a perfectly played puck into the net from short range, but only after the whistle had blown, as the sprawled and desperate Sobecki dislodged the goal from the ice. Referee Grzegorz Dzięciołowski did not count the goal over protests from the Cracovia captain and howls of outrage from the home crowd. The second period opened with a quick goal from Tychy’s Michał Garbocz, immediately followed by another two minutes later by Tychy captain Adrian Parzyszek, then gave up one to a wide shot hammered home by Łopuski to leave the score at 1:3 at the second intermission. The victory secured Tychy their first place spot in Group A of the group round of the PLH regular season with only a few weeks remaining before the playoffs begin. At present, the standings would put Cracovia and Tychy on the road to meet in the finals. Cracovia will play on their home ice on ul. Siedleckiego next against Wojas Podhale on Friday, 15 January. Face-off time has yet to be announced.